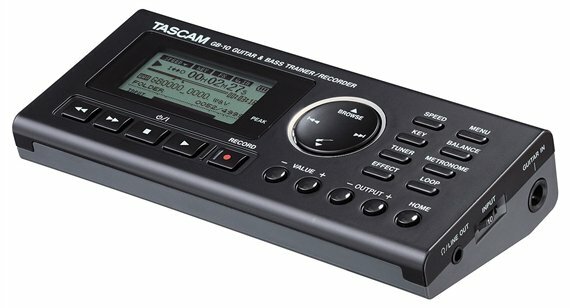 Shop TASCAM GB10 Guitar/Bass Trainer With Recorder from AMS with 0% Interest Payment Plans and Free Shipping. Based on its acclaimed line of instrument trainers, TASCAM's GB10 is the ultimate tool for guitar and bass players to learn and record new music. Load up the SD card with your MP3 collection, then loop and slow down licks without changing the pitch. Plug into the 1/4" input to play along through amp modeling, reverb and other effects. The GB10 even records your music with an overdub mode to build up arrangements. The GB10 includes a 2GB SD card for loading in your music collection. Variable Speed Audition allows musicians to independently change the speed and pitch of MP3 or WAV playback. The tabletop design is perfect for practicing almost anywhere. A tuner and metronome are also built-in for precision playback, and a footswitch input allows hands-free control. 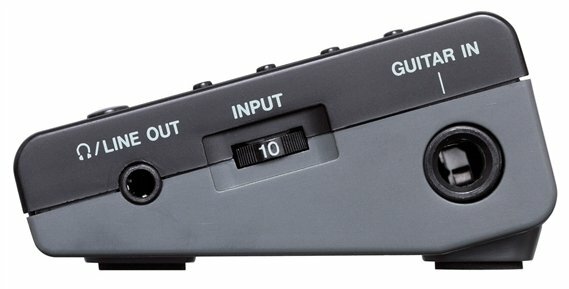 The TASCAM GB10 is the ideal practice tool for musicians of any skill level to build their technique! Pretty useful..added a 32gb sdhc card.. It's perfect for learning the fast paced music I play on bass. Lots of Jazz, Funk, Rock Fusion and Country. I have a great ear but no longer read music. This is the perfect tool for me to slow songs down and gradually pick up the pace to where I need to be. ???????? I like some of the features, but I feel it could be better. My main concern is balaceing betwwen the song and guitar volume so far. I have only had this for a couple weeks so I am leaning towards user error at this point. I have used the older models and never had a problem. This thing is awesome! Very useful for learning new songs and building technique. Outstanding piece of equipment---a MUST for the working professional musician! This unit cuts down song learning time by an order of magnitude! You can the song down to hear what you have a question about without changing pitch! Extremely user friendly right out of the box! Great product for slowing down songs to learn riffs. Good quality sound. I got my GB10 a few days ago to replace my old Tascam GT1. I think it is every bit as easy to use, maybe better than my GT1. Pretty simple and intuitive, does what I need. Seems really well made & I've encountered no issues in the several weeks I've owned it. Still on the original batteries too! I'm pretty impressed with the power consumption of this unit. No need for an ac adapter! FYI, the little 2G sd card that comes installed holds a LOT of tracks. I now have over 100 songs @ 128k mp3 quality loaded, with a lot of room for more! I've used one of their old models for cd's, & found the tracking to be a lot less reliable. This new one doesn't have that issue. Very reliable playback, & very good sound quality. As a guitar instructor, I just wish this had been around 30 years ago. The battery life has exceeded my expectations as well. The only changes I would make, would be to add a LED light to the display to make it easier to read, & better sounding effects for your guitar. Small gripes though. As mentioned, the sound quality is really good. I'm going to be using this as a backup player to my old mp3 player for all of my future guitar clinics. Plus, I won't have to charge it up on my pc's usb for 2 hours to get it ready! Nice to have a dependable backup on hand!! Looks nice. Professional design, & layout is really simple to use.